Blog > FAQ > Why Do Cockapoos do the Doodle Dash? 1 What causes Zoomies/Doodle Dash? 3 Can you control Zoomies? 4 Why do Cockapoos get the Zoomies after a bath? 5 Does your dog Zoomie? 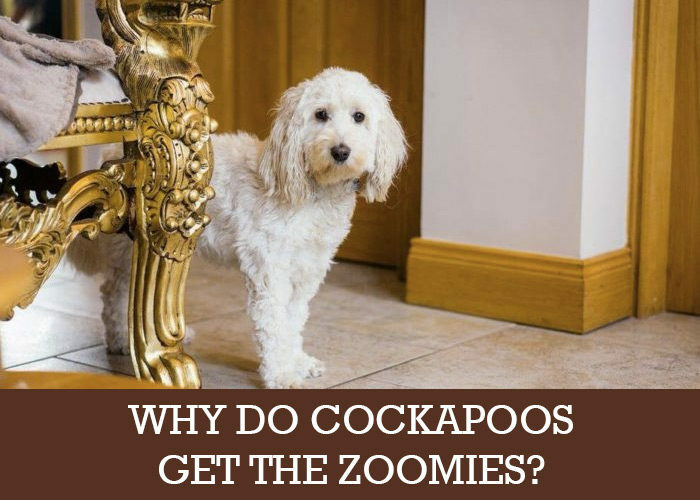 Have you ever wondered why cockapoos get the zoomies/Doodle Dash? In fact, have you ever wondered what the heck the zoomies are? The easiest way to explain it is those few minutes, say after bathing your dog, where he runs around the house like a mad-mutt. They’re also called the rips and the scientific term is ‘WTF’! Okay, not really. The scientific term is Frenetic Random Activity Periods or FRAPS. Now we know what they are, let’s see what causes them. Have you ever seen your cockapooch race around the house like a lunatic, maybe after a bath, or when you get home from a day out? It could happen late at night, when your puppy starts behaving like a ‘zoombie’ with the Zoomies. This manic display is your pup’s way of releasing pent-up energy, and while it’s more common in younger dogs, older pets certainly aren’t immune. Not at all, unless your pup pulls a muscle in the process. In puppies and younger dogs they’re more common and aren’t cause for concern. As your cockapoo gets older, these sudden outbursts will become less frequent. They’re also hugely entertaining to watch. If you notice your pup zooming around the house with a case of the Zoomies on a regular basis, it could be because he isn’t getting enough exercise. You could try increasing their physical activities, as well as exercising their brains. We have a friend who plays a game of ‘find the treat’, which takes five minutes, but it’s equal to a 30-minute walk. Why do Cockapoos get the Zoomies after a bath? The only explanation we have is that water gets in their brains and causes a hilarious malfunction! Yes, we know, that’s not the reason. Some experts believe post-bath Zoomies is a quick way for your dog to get rid of nervous energy that’s being pent up while in the tub or a confined space. Zoomies after a bath could be their way of showing you they’re relieved the traumatic experience is over. Dogs love playing. They love time with you and the attention, and Zoomies are their way of showing you. They’re also known to ‘hump’ when over stimulated. Does your cockapoo get Zoomies? And when? Are you quick enough to catch it on camera? We’d love to see.